The Midlands Air Ambulance Charity continues to save lives across the communities of Gloucestershire, Herefordshire, Shropshire, Staffordshire, Worcestershire and the West Midlands, flying seven days a week, 365 days a year. Midlands Air Ambulance Charity has grown in strength from just one helicopter flying out of a temporary airbase in 1991 to three helicopters currently serving a population of over 6 million people. Each of the three air ambulance aircraft is called out on a mission on average three times a day. The Charity can proudly say that their dedicated flight paramedics and doctors have responded to over 47,000 incidents, which is a third more than any other air ambulance service in the UK. In the past year alone, Midlands Air Ambulance Charity has responded to over 2,000 call-outs. Missions include some of the most traumatic incidents in the region. The role of the air ambulance flight paramedics and doctors is extremely tough and challenging, but also an immensely rewarding one, and therefore they never tire from hearing from those whose lives they touch. To continue this vital service, the Charity needs to raise in excess of £7 million each year. As the service receives no funding from the government, it is thanks to support and donations from the public and local businesses that Midlands Air Ambulance can continue to serve the local communities. 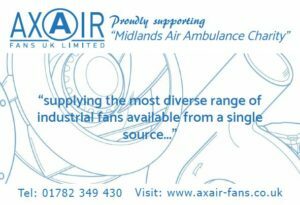 Axair is proud to continue to support the Midlands Air Ambulance Charity by way of a monetary donation. Recognising the difference the Charity has made and ensuring there is a future tomorrow, inspires them to provide the very best care to those in greatest need. This entry was posted on Monday, October 23rd, 2017 at 10:06 am and is filed under Environmental. You can follow any responses to this entry through the RSS 2.0 feed. Both comments and pings are currently closed.